Death Masks is a memorial to the animals that have been sacrificed for scientific research within the School of Anatomy and Human Biology. Verena Kaminiarz's research during her Master of Science (Biological Arts) was focused on laboratory mice, specifically disease model mice. 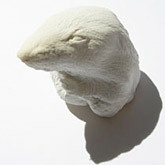 For this project she asked the researchers using mice in their work to lend her the sacrificed animals (after they were finished with them, prior to their disposal) so that she could create death masks of these animals. She made 78 death masks over the course of two months. Death Masks was a preliminary project within Kaminiarz's major research project May the mice bite me if it is not true. It takes the form of a research experiment that explores the possibility of disease model mice functioning as a medium for experimental portraiture. "As a graduate student at SymbioticA (2006-2008) I had the opportunity to work in this biological research facility to create an artistic project that examined tensions arising from animal use in contemporary medical research. The resulting work, May the mice bite me if it is not true, focuses on mice used in science to model human diseases. This work re-contextualizes laboratory animals and relocates them into a field of cultural and philosophical study. With the work I attempt to created a situation that forces questions about scientific conventions, biological art practices and the ethical and philosophical implications of the collision of these practices." May the mice bite me if it is not true opens up a conceptual space for a philosophical inquiry forcing consideration of four individual animals, their place within Kaminiarz's research / artistic production and the place of laboratory animals in general within scientific research. The work consisted of four mice positioned as living portraits of people who have died from conditions that these mice were developed to model. The resulting mouse portraits are of: Franz Kafka (lung cancer), Joseph Beuys (natural causes), Felix Gonzalez-Torres (compromised immune system) and Gilles Deleuze (lung cancer). The project mimics some elements of biological research (the location and care the mice receive) and deliberately alters others (the housing, the enrichment materials and the focus of their identities as individuals). This project is being exhibited at the University until 2011 (the anticipated life-span of the mice). Verena Kaminiarz was the first SymbioticA student to graduate with the Master of Science (Biological Arts) in 2008.